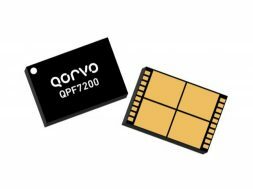 The QPF7221 provides a complete integrated solution in a single FEM for Wi-Fi 802.11b/g/n/ac/ax systems. Its small form factor and integrated matching minimizes layout area in the application and greatly reduces the number of external components. The FEM allows true 5V supply without any modifications to the supply lines and performance is a balance of maximizing on highest linear output power and leading edge throughput. The FEM also provides state of the art LTE coexistence Rx immunity for maximum range and coverage by integrating high performance temperature stable BAW filtering on receive chain.